Deal of the Day: Are we reading this right? 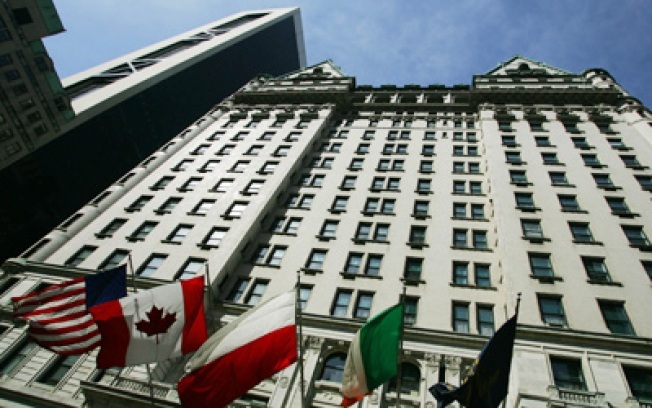 The Plaza's giving away free nights at the illustrious hotel? The Plaza is celebrating its first post-renovation holiday with a tempting deal: Three nights for the price of two between now and Dec. 30. The Plaza's new owners may have spent $400 million to renovate the iconic landmark prior to its February reopening, but it doesn't look like they're counting on the holiday season to recoup any of that cash. Between now and December 30, if you book a two-night stay, they'll throw in the third night for free. That's an extra night you can spend nuzzling up to the 24-karat gold-plated sinks and fixtures in every one of its 282 rooms and suites, sipping on holiday cocktails at the new Rose Club lounge, or coming up with fanciful errands for your white-glove butler to run. Per-night rates start at $755 (that's barely over $500 a night with the discount, and you could stay in far worse places in this city for half a grand per night); Rockettes fans will want to inquire about the package that gets you two tickets to the Radio City Christmas Spectacular. See previous Deals of the Day.